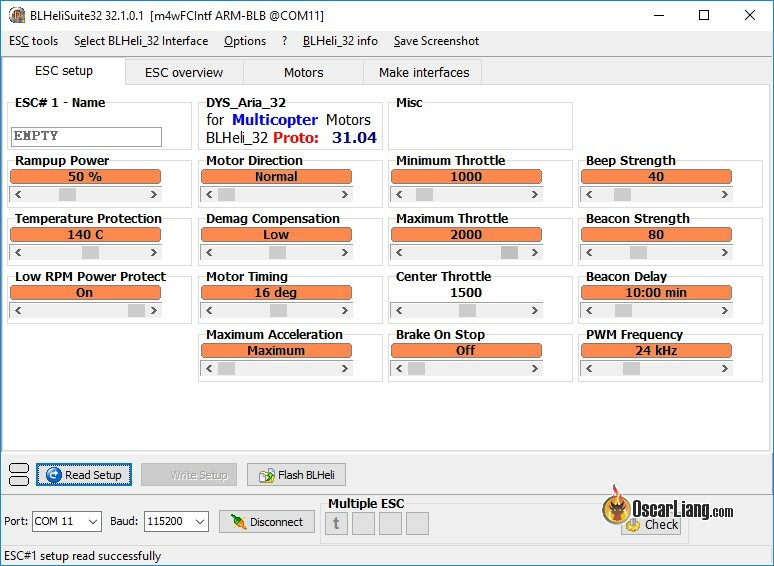 DYS has finally released their very first BLHeli_32 ESC. If you are still running their good old trusted XM30A this could be a very good upgrade for the BLHeli_32 goodness. To learn more about how to choose ESC for Quadcopters. If you haven’t learned the benefits of BLHeli_32 compared to the previous BLHeli firmwares, please check out this article. The ESC I received are apparently test samples, they are missing some features which will be available in the production version. Since these ESC’s are test samples, they are using “proto” firmware version 31.04, which doesn’t allow me to change any of the settings. I get this error: “Sorry ESC seems to be a DYS_Aria_32 pre-release Rev31.x prototype sample. It’s not possible to upgrade this ESC to a release version”. I checked with DYS and they confirmed everything will work as expected in the production version. So at the moment I can only test these ESC with the default settings. I am not sure which of the solder pads on the Aria ESC’s is the telemetry output, which you would be able to send current and RPM info to the flight controller as part of the future BLHeli_32 feature. We will have to wait until DYS release an user manual for that. I will be testing these on a mini quad, I will report back if there is any problem, stay tuned. Are there any more current settings now that these have been out awhile? So which pad is for telemetry? I ran these (production version) on a 5s capable build, running T motor 2406 2300kv motors. I love to test, and this was one of my test rigs for Many things. Anyway, after 15+ successful 4s flights, I decided to give 5s a try, and again, EVERYTHING was 5s capable. After take off, the first 5s battery on this build, a punch out resulted in a destroyed ESC that caught on fire. This is the first time in my several year “RC” career (I’ve built for more than 7 years heavily, casual builds and planes even longer than that) that an ESC caught fire. I hope this was an isolated incident! That is what happens if you go from open source firmware to closed source. You are at the merrit of the ones who provide you with it. Hopefully someone else will come up with a 32 bit open source ESC firmware.